Adam Sandler’s new Netflix special, 100% Fresh, seems to have awoken something in comedy fans of a certain age. 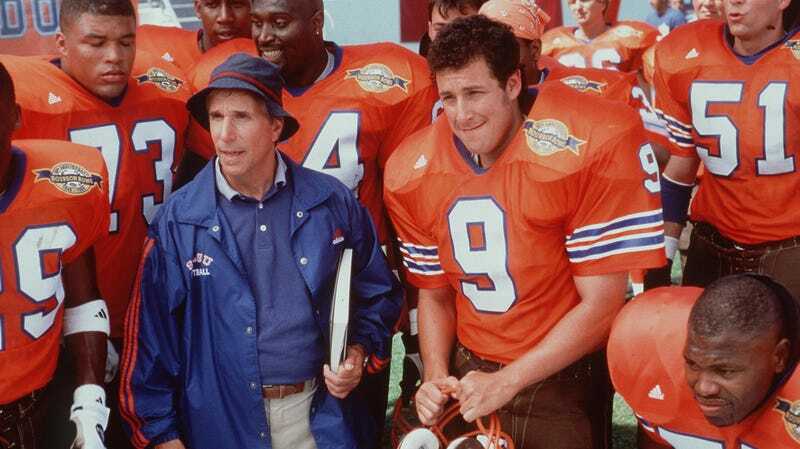 Suddenly, grown adults who long ago put aside silly voices and potty humor are remembering, “Hey, Adam Sandler is great.” With that in mind, it seems a good a time as any to revisit some of the comedian’s earlier work, including the critically maligned but still much loved sports comedy, The Waterboy. In honor of the film’s twentieth anniversary, SB Nation spoke to many of the people who worked on the film in order to delineate why it’s still remembered fondly by fans, including the fact that it took the traditional formula of a ‘90s-era Sandler comedy and flipped it on its head. Sandler’s popular comedies prior to 1998 were pretty much all fish-out-of-water stories. In both Happy Gilmore and Billy Madison, Sandler portrays a character whose antics make him stand out in a world of straight-laced, somewhat normal people. He does something crazy and everybody reacts like what he just did was crazy. But The Waterboy created a whole world of crazy. Bobby Boucher is still a fairly ridiculous character, but he doesn’t seem quite as odd next to the overbearing Mama Boucher (Kathy Bates), the bumbling Coach Klein (Henry Winkler), or the inarticulate Cajun swamp man Farmer Fran (Blake Clark). “It was the first movie where things were funny when Adam wasn’t on screen,” the movie’s writer, Tim Herlihy, tells SB Nation. “The pressure wasn’t even on him.” The movie’s core concept came about when Sandler and a few of his other old NYU pals were sitting around a table at Sandler’s house doing characters to make each other laugh. Sandler had a “socially inept” character who he thought could work as a tackling phenom. The rest of the film clicked into place when they went on a Mardi Gras visit. “We thought, ‘What a great backdrop, and the South for football,’ and it just sort of piled on,” director Frank Coraci says in the article. It’s ironic that the first film in which Sandler was allowed to take a backseat a bit was also one of the films that helped secure him as a comedic lead. But it’s hard to imagine The Waterboy working any other way. A soft-spoken guy who tackles real well just isn’t as funny without the insane Southern college football world built around him. Check out rest of the piece for a lot more on the movie.